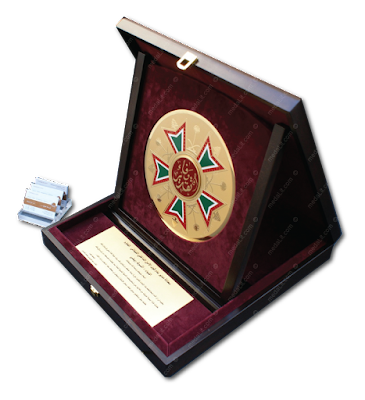 The Absi Medallion plaque Awards are characterized by a gigantic large size circular (250 mm diameter) brass plate giving the impression of a giant medal, they show very precise high quality custom-made engraving. Cut from 3mm thick brass sheets and gold-plated, they have a highlighted finish (reversed proof) to produce a very luxurious look. Presented in a luxurious box (320x320 mm).